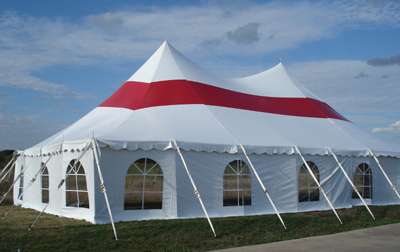 Outdoor party tents have a wide variety of uses, and no matter what your purpose is for using the tent, you can benefit from having a tent that is durable and built to last. This tent from Mystique is 60 feet by 60 feet, and it has a high peak. It is rated to withstand winds up to 70 MPH in optimal conditions, and it comes with galvanized poles and reinforcement straps for the best stability. The triple reinforced rods allow you to have extra security when using this tent.